Dr. Tara Scarlett is a true South Jersey girl having been born and raised in Woodbury and now residing in Swedesboro. She knew she wanted to be a veterinarian since she was 5 years old. From playing ‘nurse’ to a nest of baby squirrels that had fallen out of a tree to trying to save a bunny she found, her love of animals has been, and continues to be, deep-rooted. She graduated from the University of Pennsylvania with a degree in Biology and continued her studies at the UPenn Vet School and graduated in 2004. Since then she has been practicing general medicine in the South Jersey area. 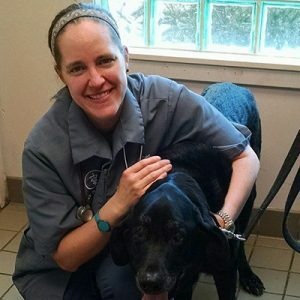 Dr. Tara is extremely passionate about client education and preventative care and she is very excited to be a part of the House Paws team! She has a huge soft spot in her heart for the kitties but she loves all furry creatures! She enjoys spending her downtime with her husband and two young children and two kitties named Charlie and Pickles. Tara enjoys running, swimming and fishing in her free time, reading and putting up fruit preserves. She’s a closet Trekkie (Next Generation fo course!) and a baker at heart and enjoys surprising her loved ones and coworkers with goodies!